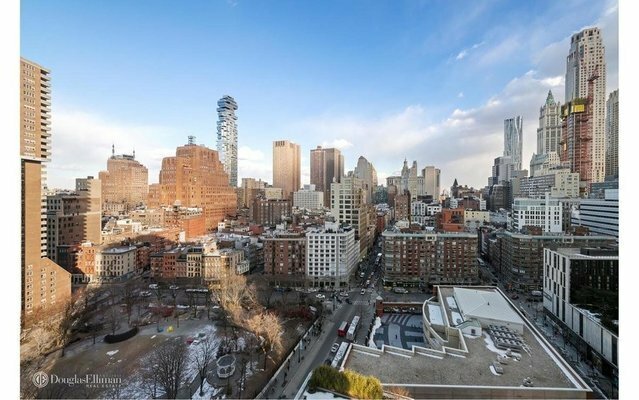 Now available highly-sought-after E-line in 200 Chambers, Tribeca's premier luxury full service building. Expansive pristine one bedroom one and a half bath with magnificent unobstructed open city views with high end finishes. The largest one bedroom line in the building. There is the option to convert the dining area into a separate home office or second sleeping area, if needed. The apartment features floor to ceiling windows an open kitchen with top of the line appliances equipped with high-end Sub-Zero, Viking, and Bosch appliances and ample storage. The king-sized master bedroom, which also has breathtaking eastern views, has a walk-in closet and an en suite master bath with deep soaking tub and separate shower stall. There is also a separate powder room for guests in the gracious entryway. Full size washer dryer with an extensive amount of closet space and central AC/Heat. This luxury high rise set in a prime Tribeca location designed by acclaimed architects Costas Kondylis & Partners and developed by Jack Resnick & Sons has all the amenities and luxuries including a 24 hours concierge staff and doormen, stunning lobby entry, landscaped roof top terrace with spectacular views of the Hudson River, Washington Market Park, a 50 foot sky lit indoor lap pool and state of the art 24 hour gym, children's playroom, resident's lounge and on-site parking garage. The resident's lounge with ample seating has a 60" wall mounted plasma television, wireless internet access, a glass enclosed conference room, and a full pantry kitchen for those privately catered special occasions. The largest Whole Foods in NYC, Bed Bath & Beyond, and Barnes & Noble are right outside of our Warren Street entrance.